available in 4 basic styles. The hand laid firebrick in the firebox highlights the authentic styling and will burn wood or gas logs. 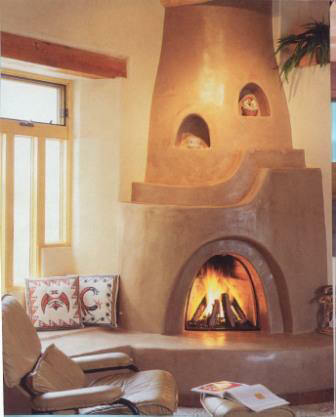 To enhance the look of the Southwest Kiva®, bancos can be added to either side as well as nichos on the top portion of the fireplace. The frames may be extended or lowered to accommodate various ceiling heights. 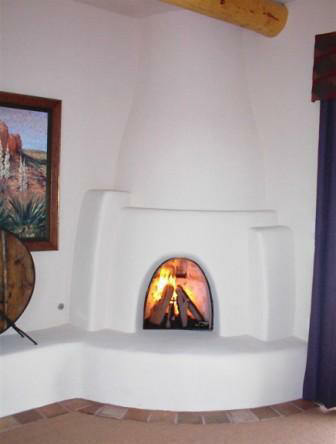 The Southwest Kiva® firebox is made up of 3 separate parts: top, center, and base. It is cast of concrete and vermiculite and the interior of the firebox is lined with actual firebrick. The firebrick creates a real masonry look while reducing heat transfer as well. 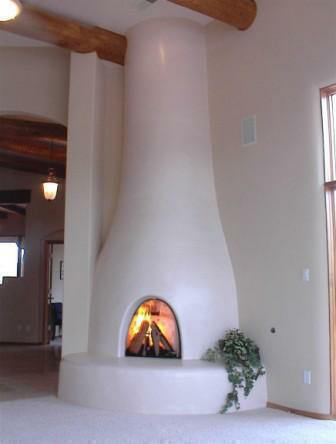 The system uses UL approved 8" air-cooled chimney for easy, inexpensive, and lightweight venting. The chimney may be purchased from local fireplace dealers. 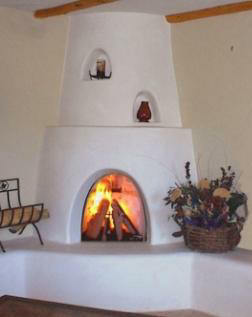 The frame creates the style and shape of the fireplace. The frame is constructed of lightweight 1/2" EMT conduit, which make the fireplace safe and non-combustible. It can easily be cut for lower ceiling heights or extended to adjust for a higher ceiling. The frame is placed over the firebox and is finished with plaster. Various plaster finishes may be added to create the desired look.